HDD crashes more than doubled in the last four years, prevailing as the most common cause of data loss according to customer data. When asked about the causes of their most-recent data losses, 66% (compared to 29% in 2010) of 1,066 surveyed customers cited a hardware crash or failure, followed by 14% claiming human error (compared to 27% in 2010). Software failure ranked as the third most common cause of data loss with 6%. HDD crashes prevail as the most common cause of data loss. 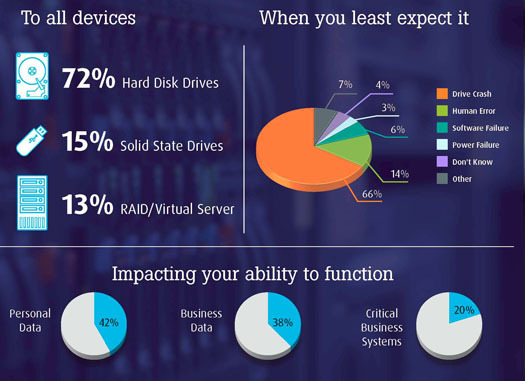 An overwhelming 72% of those surveyed noted that their most recent data loss came from a desktop or laptop HDD, followed by SSD (15%) and RAID/virtual services (13%), showing that data loss impacts every type of storage from the consumer grade up to the enterprise. The reason appears to be simple: even though HDD shipments are on the decline, they are still expected to outpace SSD shipments three to one in 2014, there are simply more HDDs in circulation because they are cost effective and manufacturers have perfected their design and production. As a result, HDDs comprise the vast majority of the data recoveries addressed. The survey was conducted among customers across North America, Europe and AsiaPac. Looking at individual response segments, laptop and PC crashes prevailed as the leading cause of data loss among both businesses (71%) and home users (72%) respectively and SSD device loss ranked second, accounting for 18% of data loss cases for home users and 10% for businesses. Storage media fails regardless of type; it is just a matter of when. This fact, coupled with the fact that HDDs are still the most prevalent drive is why HDD crashes have and continue to be the most common cause of data loss. To avoid such a failure, one should regularly defrag their computer, check its storage capacity, and run antivirus software as well as HDD monitoring software. Beyond good health practices, businesses and home users should have working redundancies, such as a backup device or service in place, and a continuity plan that is current and accessible in the event of a loss. What is at stake? Among businesses, 27% said their most recent loss disrupted a business process, such as prohibiting them or their company from actually providing a product or service to their customers. A further 15% admit to losing personal data from their business machine contrasted with 7% whom acknowledged losing business-related data from their home machine.